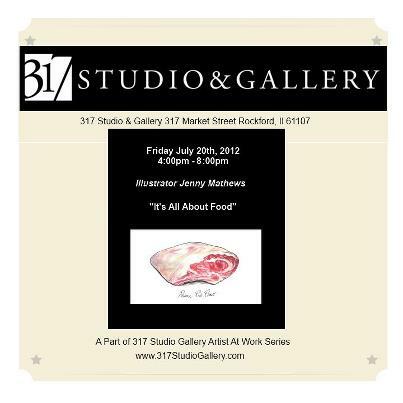 Artist Jenny Mathews will be displaying her mighty illustration skills Friday, July 20th at 317 Studio and Gallery in Rockford, Illinois. The exhibit will be comprised entirely of illustrations of food. Prime Rib Roast is an example of the type of work you'll see at this show. Twenty-five mouth-watering culinary delicacies that will have you drooling. Wine, sushi, tender cuts of beef etc. If you are looking to decorate your kitchen these works are perfect. And the most amazing part is their size. These are Tiny Drawings, which means each piece is 6x6 or smaller. If you don't see something you'd want to eat, contact Jenny and she can draw it for you, frame it, and send it to you. You want Paella, Jenny can make you Paella. Contact us for pricing.